A custom built three manual Wyvern C344 with moving drawstops. Replacing a large pipe organ that although was ailing had presence. To do the former justice we have installed a large speaker system across the two pipe chambers with multiple channels are divided across the individual organ departments and ranks. There is a subbass channel to add gravity to the low-end pedal. The Abbey of Our Lady, Help of Christians, commonly known as Worth Abbey, is a community of Roman Catholic monks who follow the Rule of St Benedict placing the public prayer of the Church (the Opus Dei or work of God) at the centre of their lives. But music is also a strong tradition at the Abbey and the attached school uses the Abbey Church for regular services. We are proud to have been chosen to build the magnificent new organ for the Abbey following a major refurbishment. This impressive three manual has a floating Bombarde division and is housed in a terraced console built in walnut to match the new seating layout of the church. The organ is voiced in the French Romantic tradition. The large concealed audio system of over 30 cabinets and the huge acoustic combine for a thrilling spine tingling sensation. Lorne and Lowland Church, Campbeltown. Built in 1872 to the design of John Burnet influenced by Italian Renaissance style. Its bell tower is a well known landmark. This grand building has two stairways that lead from the entrance foyer to a horse-shoe gallery. The pulpit is integral with organ case that housed the original Brindley & Foster. We were commissioned to build a custom Wyvern C332 with 15 channel audio system. The large array of speakers have been laid out in traditional fashion within the existing pipe chamber. 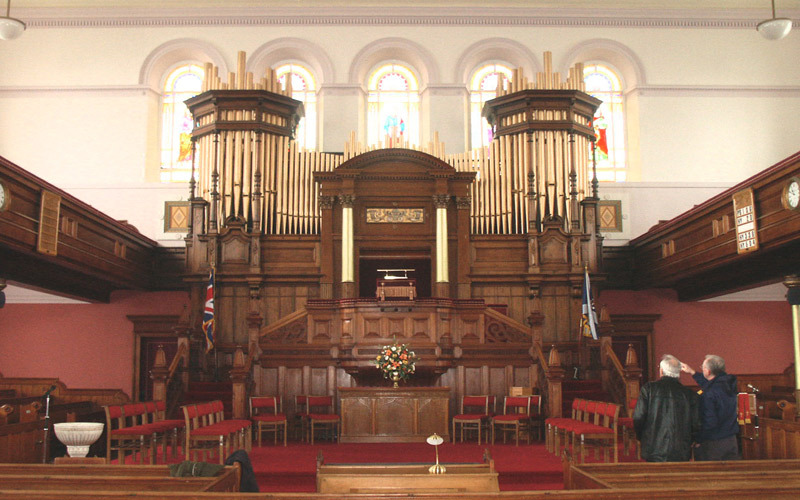 The organ console is partially sunk into a central organ pit that is a feature of several larger Church of Scotland buildings. The church is dangerously close the renowned Springbank Distillery! Custom built Wyvern C236 with WpX technology. 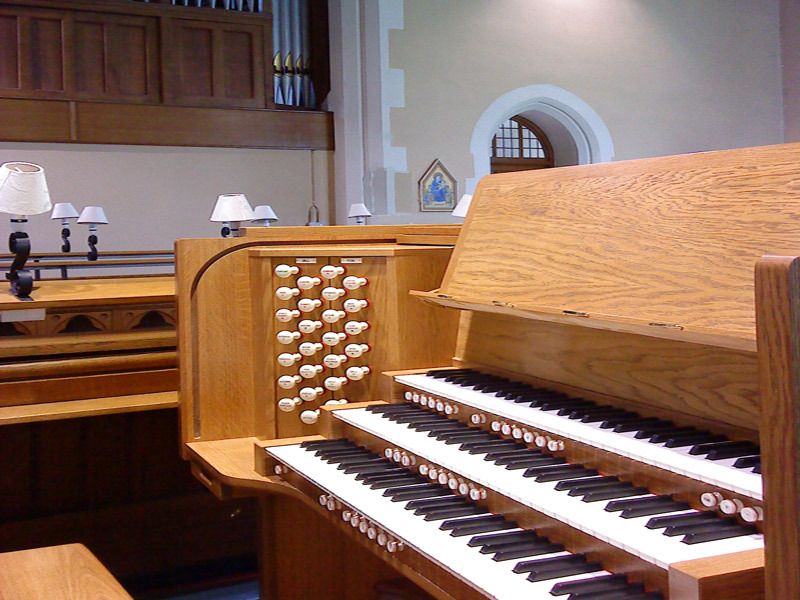 The organ has a high quality console with KA drawstops. It is a two manual instrument plus a floating Choir division. 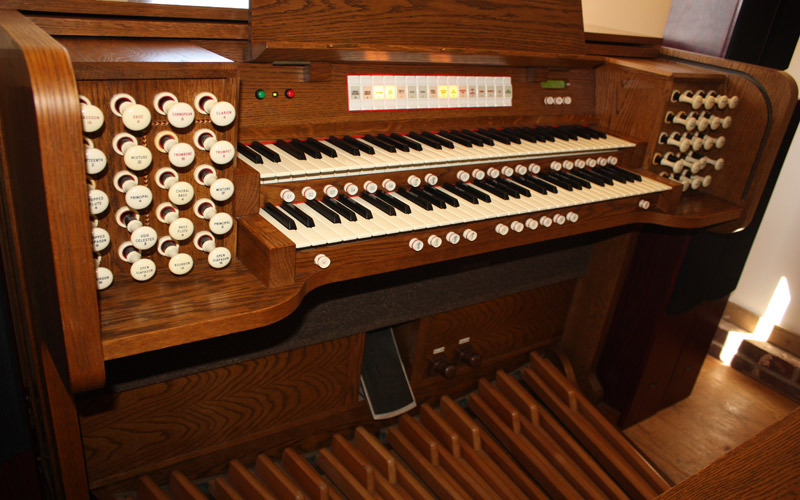 In addition to the default English specification the organ has two alternative voice sets: French and German. The console is positioned in the rear gallery. It has an external audio system of 8 x 100 watt amplifier channels, 2 x Gt; 2 x Sw; 2 x Pd; 2 x Ch with 8 full range speakers installed in the original pipe chamber. The University commissioned Wyvern to build a Wyvern Pastorale 346 for the newly refurbished University Hall. 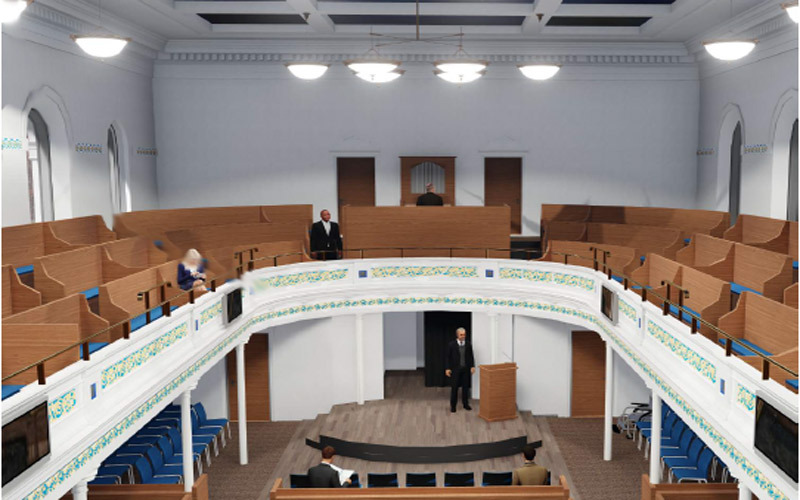 The instrument is installed at the centre of the gallery with the extensive self-contained audio system providing good sound coverage throughout this elegant hall. Just outside the city of Bath lies the small village of Widecombe with its historic Parish Church. We built a Cantata 226 with the speaker system concealed at high level in the roof trusses so retaining the aesthetic appeal of the building. Keeping the main speakers together provides a focal point as you would expect from a pipe case but also the ability to divide the divisions of the organ between separate speakers). As the only space for the console was at the front of the church a secondary monitor system is combined in the console and a further 2 small cabinets inside the Chancel arch. With a strong tradition in music there was a requirement for a high quality organ both to lead school services and for the tuition of organ scholars. This large four manual was designed and built for the school with contemporary design speaker cases to complement the chapel architecture. The basilica at Knock is one of the largest churches in Europe with a seating capacity of circa 8,000 and attracts visitors from around the world. Wyvern were commissioned to build a new organ for the building that was refurbished in 2015 the centre piece of which is one of Europe's largest mosaics, a depiction the witnesses to the apparition. The organ installation faced special challenges to obtain an even sound coverage throughout this vast building. 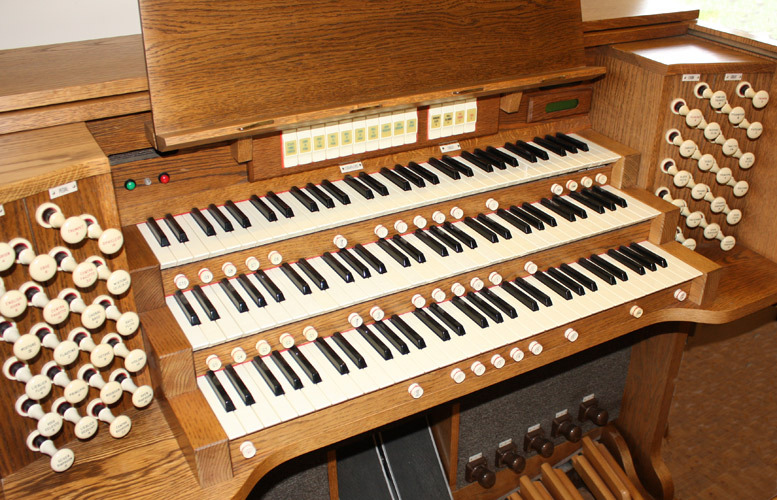 A new three manual Wyvern custom organ of 41 stops. One stop being Cathedral Chimes, especially requested by the Vicar, a B.Mus. 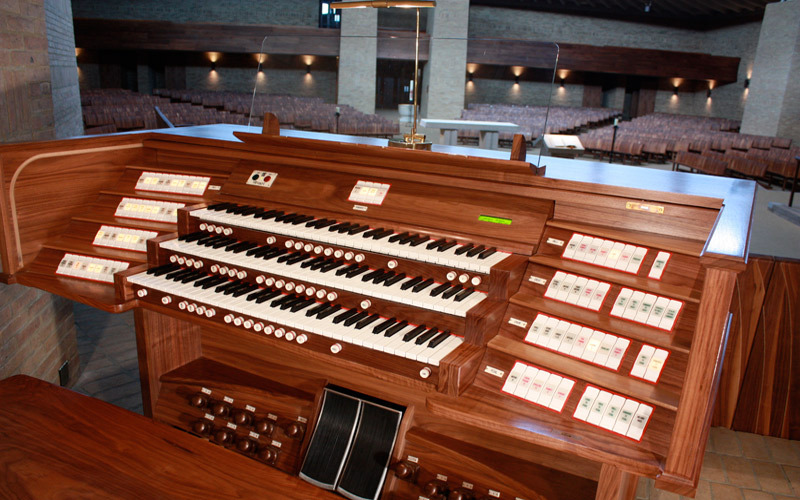 The handsome console is situated behind the choir stall on the south side, while the large speaker system is located behind the pipe façade of the previous organ.